If you manually create transactions in the transaction screen, have a look at How to record a livestock transaction in the transaction screen. 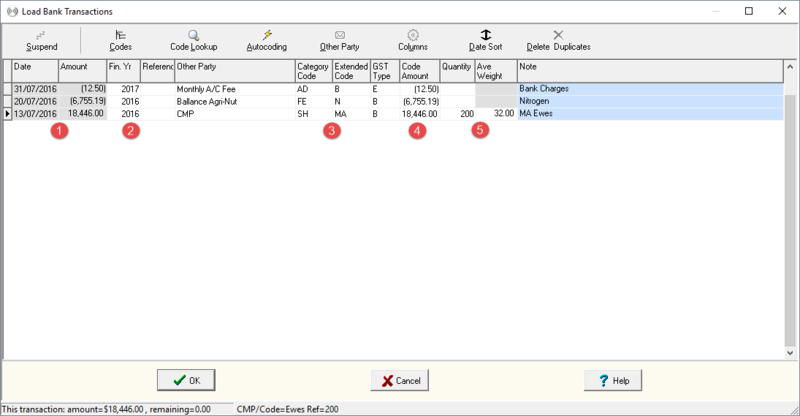 The information in the Date and Amount columns cannot be adjusted as this reflects what has happened in the bank account. If you sell stock around balance date it's important to allocate the transaction to the correct financial year so that accurate closing stock numbers are captured. TIP: By changing the financial year field to the previous year, the sale/purchase date defaults to the last day of the previous financial year i.e. 30 June 2016. Code the transaction to the correct stock class in your database, not necessarily how you class them in the paddock. How do I record births, deaths & missing? How to record opening numbers in your livestock rec.